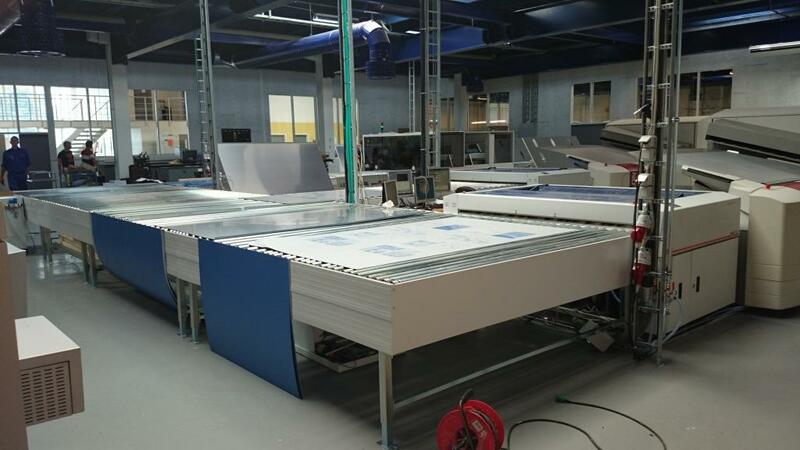 The plate-making department is one of the most automated in the total print production flow. There is, however, one part of the plate-making process, which lacks “the final touch” in automation: The feeding of offset plates into the CTP systems. The majority of mid-sized and VLF CTPs are equipped with plate-loading magazines, where a small stack of offset plates are loaded manually into the magazines by the operators. With several plate magazines it is possible to load the CTP for quite a long time of operation without manual interference, but it does not change the fact that the plates must be put manually into the magazines, which is a quite heavy work. This situation changes to be far more challenging for VLF CTPs running a lot of different formats. This is typically the situation among web offset printers with a range of presses with various sizes. In this situation a plate magazine with a capacity of 300 plates does not last long for 4-5 web-offset presses. An alternative is to use a skid-loader, where a full pallet of plates can be supplied to the CTP, but with the maximum use of 2 online skid-loaders a lot of manual pallet changes in the skid-loader are required in an installation with 4-5 different web-offset presses. A skid-loader and a pallet magazine can be combined, but this does not eliminate the need for a lot of manual interference in plate-making department. Yaskawa has developed a robotic solution, which can feed two different CTPs with plates from full pallets of plates in a nearly innumerous number of plate sizes. In this solution the plate supplier just has to put his full pallets on the rail system, and the robot takes care of everything else.